Are you an attractive, female red-headed teen with dreams of appearing on the big screen next summer in Marc Webb’s The Amazing Spider-Man? Face it tiger, you’ve just hit the jackpot. SuperHeroHype has learned that a casting call has gone out for that very part under the film’s secret title, "Fiona’s Tale." The exact description calls for an, "actress to portray beautiful red-headed teenage girl for featured background…(18+ only)". Interested candidates are encouraged to apply at [email protected]. 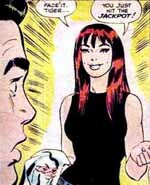 Naturally, the notion of a beautiful red-head being cast in Spider-Man instantly brings to mind the role of Mary Jane Watson, though the odds of casting such a part with a background actress are unlikely at best, especially if the plan is to introduce MJ later in the rebooted series. Still, the part could be a inside joke, a tease of her future appearance or, just as likely, a completely unrelated character. Let the speculation commence! The film, which stars Andrew Garfield, Emma Stone, Rhys Ifans, Denis Leary, Campbell Scott, Irrfan Khan, Martin Sheen and Sally Field, resumes shooting this week in New York City and is scheduled to hit theaters on July 3, 2012.